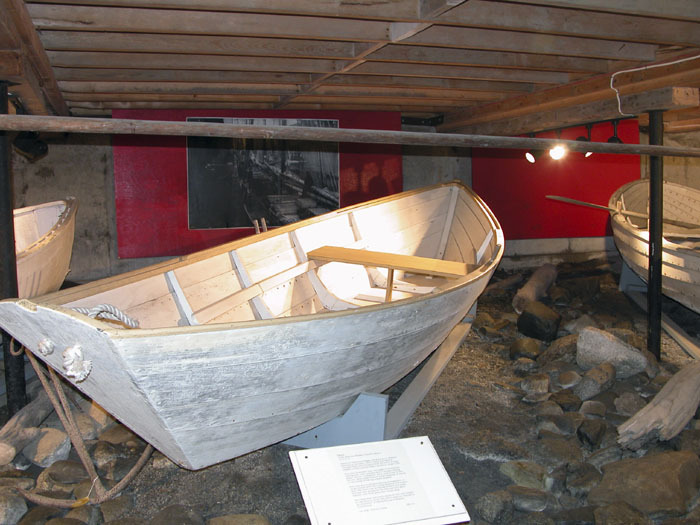 This reconstruction of George Waymouth's Lighthorseman pulling boat was built by the Atlantic Challenge Apprenticeshop to help researchers better understand where Waymouth had gone on his 1605 excursion from Allen Island. Some say he went up the St. George River and others say he made it to the mouth of the Penobscot River. Here her crew is trialing her, prior to rowing and sailing from Allen Island up to the Penobscot River mouth and back in 24 hours. 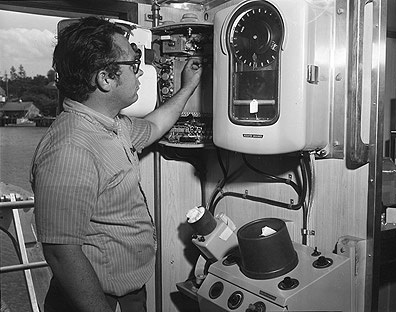 Navigation electronics aboard the 109-foot steel side trawler Robert F. O'Hara, built at the Harvey Gamage yard in South Bristol, Maine in 1971. 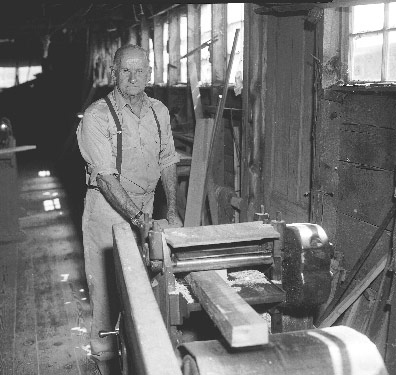 Gus Skoog built more than 80 boats, mostly lobster boats measuring more than 28 feet long, and another 30 smaller boats. He worked from the 1950s to the 1970s in his Vinalhaven shop. He worked until he was 88. 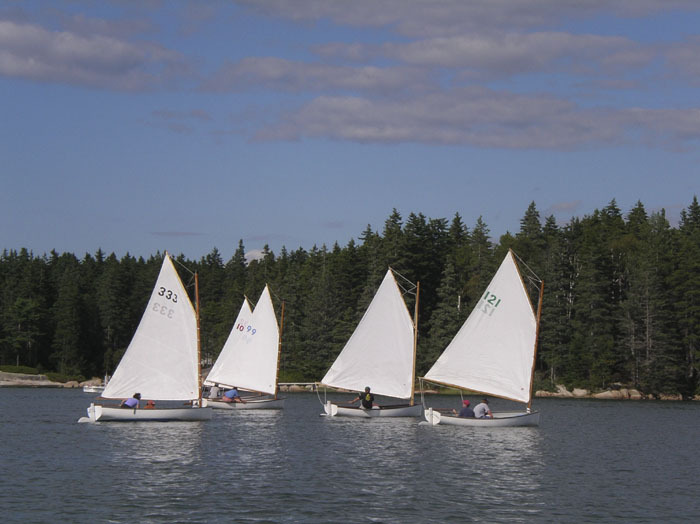 The Mill River Race is a North Haven dinghy favorite. Starting in the Fox Islands Thorofare between North Haven and Vinalhaven, the course runs first through open coves then into an intricate network of ledges and islands in the narrow Mill River to a turning mark at a bridge at its head, then a different route to return. It can only be sailed at high water as most of the course is over tidal flats. 16-foot dory, built in 1936 by Malcolm Brewer of Camden. She has the straight sides of a schooner-carried fishing dory, but is smaller and lighter. She was hardly used. The buyer took her to Noank, Connecticut and used her for decoration. 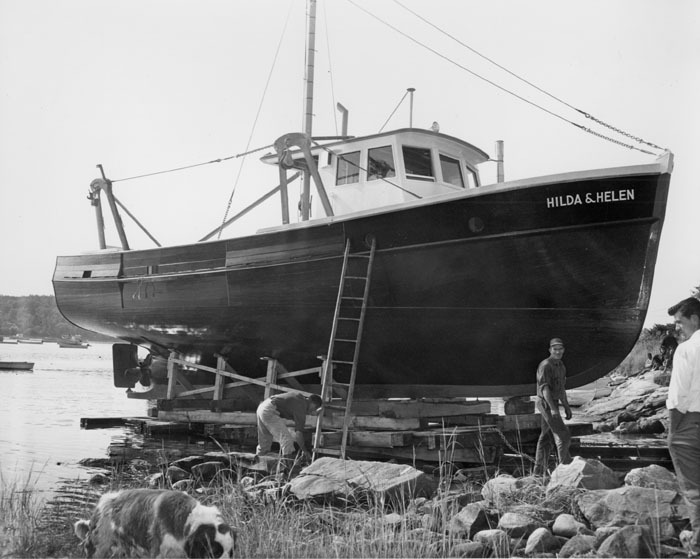 Hilda and Helen was a 40-foot fishing vessel, built by Padebco Boats of Round Pond, Maine. Set up as a small dragger, one of her size was designed for inshore banks rather than off shore banks like Georges Bank. In 1967, there was still an inshore dragging industry; now there is not. 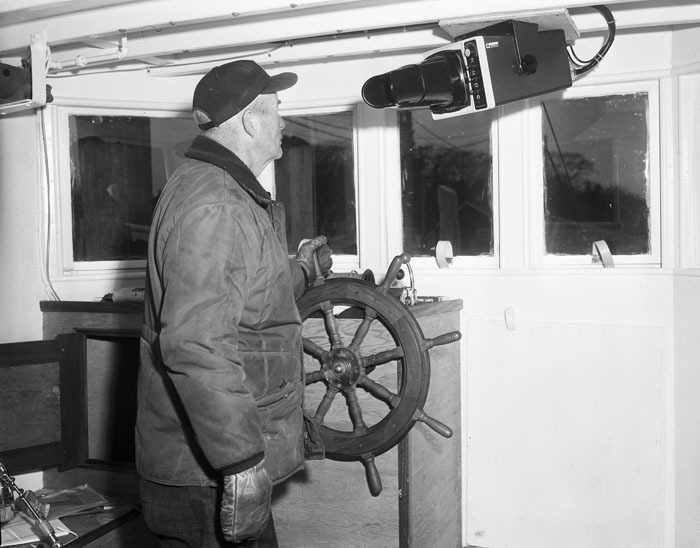 Wheelhouse on Dragger "E.G. Winters"
The dragger E.G. Winters was built at the Harvey F. Gamage shipyard in South Bristol, Maine, in 1976. This photo shows the central position of a radar unit. A corner of a radio shows on the left. Today's wheelhouse would have a plotting depth finder, a GPS unit, an auto pilot, and aboard a fishing vessel, a fish finder. 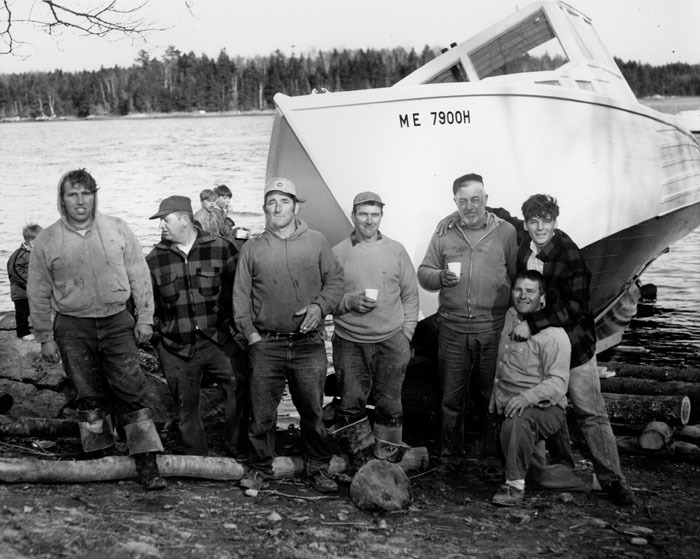 "Red" Boutilier took this picture as he reported on fishing vessel construction in the 1970s. Read more about Wheelhouse on Dragger "E.G. 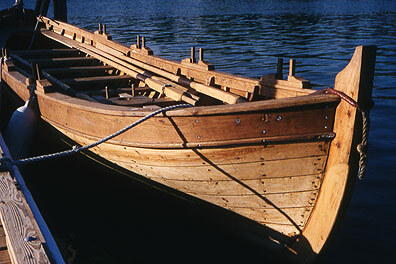 Winters"
This reconstruction of George Waymouth's "Lighthorseman" pulling boat was built by the Atlantic Challenge Apprenticeshop to help researchers better understand where Waymouth had gone on his 1605 excursion from Allen Island. Some say he went up the St. George River, and others say he made it to the mouth of the Penobscot River.